◆ If cancelled or modified within 5~7 days before the arrival date, 50% of deposit will be charged. ◆ If cancelled or modified within 2~4 days before the arrival date, 80% of deposit will be charged. ◆ If cancelled or modified within 3 days before the arrival date or in case of a no-show, 100% of deposit will be charged. Sleepy Dragon Hostel is located in a great area of Taipei. We are just a stones throw away from the Raohe night market. Easy access to Taipei 101. The MRT is just a few minutes straight down the road. Sleepy Dragon is your home away from home. No matter what your schedule we are more than happy to assist you. Each rooms has a great view and is fitted with 12 bunks and lockers. 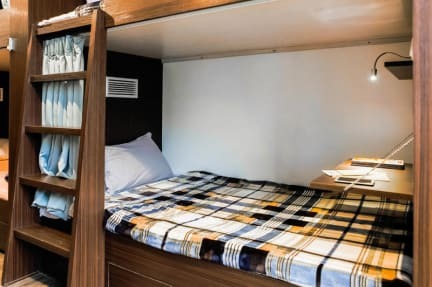 Each bunk has its own enclosed shoe box, privacy curtain, fold-out desk, lamp, shelf, power outlet, and air conditioning. We do allocate one room for females-only. The bar is stocked with various kinds of beer. We even make you breakfast every morning.